If you have sliding doors on the closets in your home but want bi-fold doors instead, you might be thinking of creating bi-fold doors by cutting the sliding door panels in half vertically and connecting both halves of each panel with hinges, because that is what a bi-fold door is. 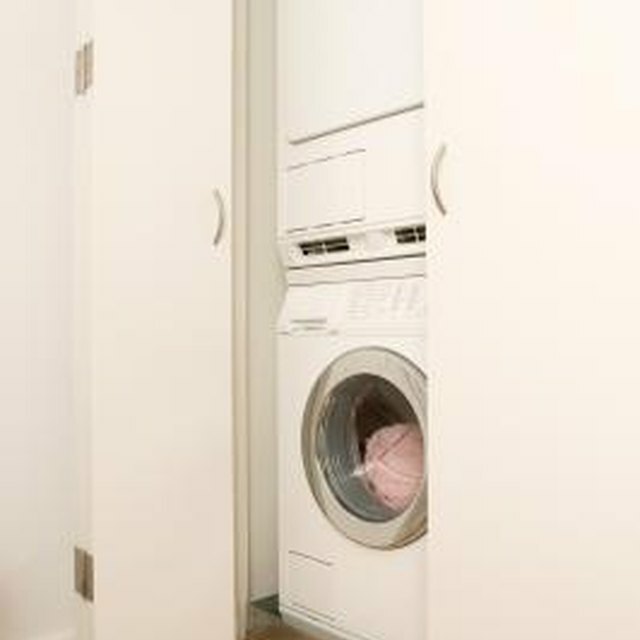 Unfortunately for this notion, many sliding closet doors are either hollow core or too heavy to use as bi-folds. It makes more sense to replace the sliding doors. For that, there are bi-fold door kits. Remove the sliding doors by lifting them off the brackets at the top and tilting them up and away from the bottom brackets. Set them aside, and then unscrew the track and brackets with a screwdriver. If there is a recessed track on the overhead frame, cover it with a piece of wood. Cut it to the width and length of the horizontal door frame, and then install the board right over the track, in essence creating a new surface. You will place the board over the track and screw it in place with a screwdriver and wood screws. Measure the length and height of the opening and buy a bi-fold door kit of the right size at a local home-improvement store. Install the bi-fold door track over the location of the former track by screwing it in place with screws and a screwdriver. This hardware is included in bi-fold door kits. Hold a plumb bob at the center of the newly installed track at what is called the bi-fold door pivot point at a top corner of the track. Hold the plumb bob steady and mark on the floor where the plumb bob touches. Do the same on the other end of the door frame. This is done to make sure the installation will be perfectly straight. You will install the bottom pivot brackets for the bi-fold doors where you have made the marks on the floor. Install the bottom brackets of the bi-fold doors so the pivot holes are over the marks you made using the plumb bob. Screw the brackets into the floor boards, using a screwdriver and the hardware provided with your bi-fold door kit. Install the top pivots, which are two rod-shaped parts, in the top of the bi-fold doors near the outside edge. Push them into the pre-drilled holes by hand. Do the same for the top rollers, two roller wheels on a rod. Insert them into the holes near the center edges of the doors. Insert the bottom pivots into the holes in the bottom of the doors. These are also rod-shaped parts. Lift the doors and place them so that the top rollers and pivots fit into the track. The parts will contract slightly on a spring to allow you the space you need to slide the bottom pivots onto the bottom brackets. Test the doors by opening them, and adjust the positions of the bottom pivots to straighten the door as needed.